To say that it gets hot in Arizona is, of course, a ridiculous understatement. And all that nonsense about "It's a dry heat," doesn't really cut it when the mercury soars past 95 degrees—which is fairly routine in the summer. You could stay inside all day and crank up the air conditioning. Or you could head to one of the state's water parks and cool down. All of Arizona's water parks are located outdoors. The state has yet to offer any indoor water park resorts. Arizona water parks are arranged alphabetically. Click on one below for more details. Big Surf is a good-sized water park with over 15 attractions. With its Waikiki Beach, iIt claims to have introduced America’s original wave pool. The wave pool welcomes body surfing, and the park also rents rafts, boogie boards, and stand-up surfboards. Other highlights at Big Surf include The Abyss, an enclosed tube slide, and Kilauea Cove, twin enclosed slides. The park also offers body slides, tube slides, speed slides, water basketball and volleyball, and play areas for younger children as well as toddlers. SunSplash is a large park with plenty of attractions, including an uphill water coaster, a bowl ride, a half-pipe slide, tube slides, body slides, speed slides, a wave pool, a lazy river, an interactive water play center, an activity pool, and a kiddie play area. In addition to the water slides, Golfland offers "dry" activities such as mini-golf, bumper boats, bumper cars, and Indy race cars. King ben’s Castle is a large family entertainment center with more than 200 arcade games and laser tag. The water park is only open to registered guests at Arizona Grand Resort. For a hotel amenity, the park has plenty to offer, including an 80-foot tall water slide tower, a wave pool, a sports pool, an active river, a hot tub, and a children's water play area. Cabanas are available to rent. 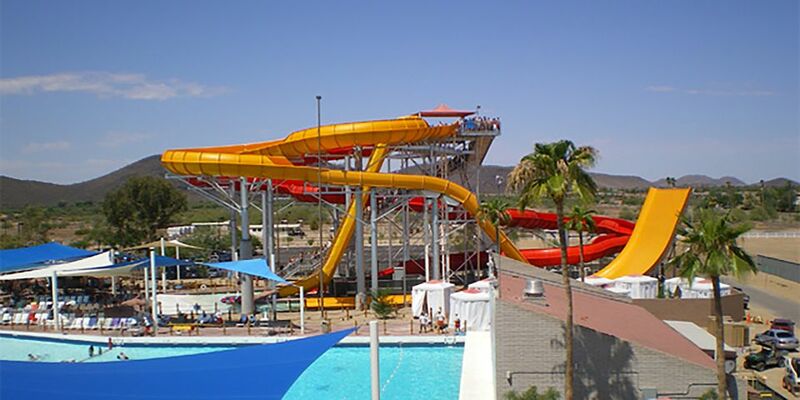 Hurricane Harbor is the biggest water park in Arizona. In fact, it is one of the biggest water parks anywhere. Among its many attractions are a water coaster, the Constrictor flume slide, a funnel ride, a family raft ride, a bowl ride, a mat racing slide, tube slides, body slides, a half-pipe ride, a lazy river, a wave pool, an activity pool and two kiddie water play areas. Note that the park used to be known as Wet 'n' Wild Phoenix. ASix Flags bought the property and renamed it in 2019. Before it was called Wet 'n' Wild, the park was known as Waterworld Safari. Waylon's Water World is a medium-sized park with a lazy river, a mat racing slide, an interactive water play center, the Constrictor slide, and a bowl slide. The park is part of Z Fun Factory, a family entertainment center with mini-golf, go-karts, an arcade, a pirate playhouse, and batting cages. There is also a restaurant and bar.